"This wholesome, warming chowder is quite simple and filling." Cook the bacon and olive oil in a large pot over medium heat until the grease has rendered out, and the bacon has begun to brown. Remove bacon with a slotted spoon, and set aside. Stir the garlic, onion, carrots, and celery into the bacon drippings, and cook for 10 minutes until the onion softens and becomes translucent. Stir in the flour, and continue cooking and stirring 10 minutes more. Pour in the chicken broth, and season with cumin, red pepper flakes, garlic and herb seasoning blend, bay leaf, thyme, salt, and poultry seasoning. Bring to a boil over high heat, then reduce heat to medium-low, and simmer for 10 minutes, stirring frequently. Meanwhile, place broccoli in a steamer over 1 inch of boiling water, and cover. Cook until tender, 2 to 4 minutes. Drain, and place into a blender. Puree until smooth, using some of the half-and-half as needed. Add the broccoli puree, remaining half-and-half, potato, clams, and chicken to the simmering chowder. Return to a simmer, and cook until the potatoes are tender, about 15 minutes. Stir in the cubed butter until melted, and sprinkle with Cheddar cheese to serve. A surprisingly quick-and-easy, creamy clam chowder with bacon and potatoes. thought I had clams on hand, but didn't, so I made this per original recipe without the clams, and it was EXCELLENT as it was. Don't think I would like the clams anyway. Yum! I added a bit of extra chicken boullion and skipped the carrots. The cumin really added to the taste! Taste better the 2nd day after the flavors have mixed. A keeper. Sooooo tasty and flavorful! We will make this again! Even my 5 and 10 year old kids loved it! We added a little extra chicken broth towards the end. YUM! 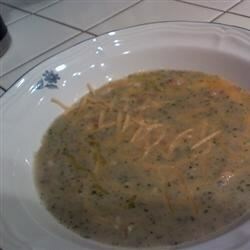 GREAT RECIPE, EVEN MY WIFE WHO DOESN'T CARE FOR CLAM CHOWDER ENJOYS THIS RECIPE!! !